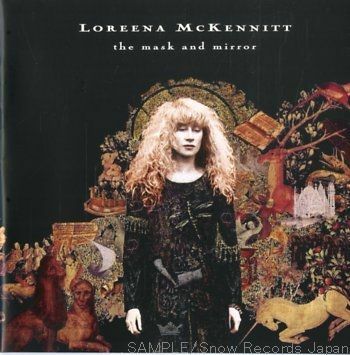 “The Mask and Mirror” is an album mostly influenced by Loreena’s travels. Her trips to Spain and Morocco, were source of inspiration for this album. This recording began with an image of a night market in Spain… not that I’d ever been to one, but somehow there was enough of a picture haunting me that I was driven to find out more about it. I delved into Spanish history and began learning more, not only about history per se, but also the history of religion and the way in which Spain served as something of a crossroads for the evolution of Western “civilization” in the areas of literature, music, art, science (particularly astronomy) as well as religion, to name but a few. This recording is, in part, a documentation of this exploratory journey, led by my own growing and persistent curiosity. It led me from the more familiar turf of Ireland and its sacred Celtic imagery of trees, across the Pyrenees and west to Galicia, down through Andalucía and past Gibraltar to Morocco; through the thoughts and literature of the troubadours of France, the Knights Templar and the Cathars, One Thousand and One Nights, the Sufis and the Gnostic Gospels. The question which kept appearing was, “What is God and what is religion?” In our human need to be spiritually engaged, how was this done, and how was it missed or manipulated? Rather than reflect any definitive view, I nave aspired to cast a light on a few things that carne to me by way of that exploration and leave you to be haunted by your own curiosity. ople were spiritually engaged before and during the advent of many of what are now considered the world’s major religions. The word “mystic” and the varying concepts that lie behind it seemed to be expressed in various religions. I was drawn to paint a musical picture to represent the mystical elements emanating from things Celtic, Islamic, Judaic and Christian, with a particular eye on those people referred to as the Sufis, who could be found in any religion, at any time. Through Idries Shah’s book The Sufis. I carne a little closer to comprehending who these people are and who they have been and the roots of their understanding of the world and their harmonious mysteries. As inmuch medieval work (such as the Unicom Tapestries, which heavily influenced the cover design of this project), life and human expression have been portrayed in parables, or in symbols articulated as creative vehicles, like folk songs. This is a fablesque tale in the Celtic fashion, which tells of a girl envious of her sister’s lover, and who is driven by jealousy to drown her. The drowned sister is rebom as a swan, which in medieval times was a symbol of death, and is transformed yet again into a harp which is brought to, and played in, her father’s banquet hall by a travelling bard. Seeing that he was heavily influenced by another mystic, St. Theresa of Avila who in turn carne from Jewish ancestry, St. John of tne Cross brought perhaps a more Semitic angle to his Christian duties and perspectives. Many would argüe that it was due to these influences that his work was so influential and insightful in the area of mysticism. This song was inspired by the myriad of circles in the night market in Marrakesh during the time of Ramadan: each group of people with its own special drama of music, poetry which is directly connected to drumming rhythms, snake charmers, monkeys and “magic” made up of bones, stones and seeds which could be found lying in bulk on rugs. It is also an introduction to the various religious components present in this part of the world, particularly prior to 1500: Christianity, Judaism, and Islam. Three different moments at three very different times and places seem to be closely related in my mind. One was a visit to a Benedictine monastery outside of Quebec City; the next carne listening to men chanting at a mosque in Marrakesh in the early hours of the morning, and finally, the third carne witnessing the sunrise at a thousand-foot-high sand dune in the desert near the Algerian border. One was my own personal experience of connecting with what I considered to be an expression of God, and the others, being witness to someone else’s. Through these experiences, I realised two things: we all have a need to understand what god is, and that we fmd that, and do that, in different ways. this place, with monasteries, inns and resting places set up along the way. These routes, which were at their most active between 1000 and 1598, became tremendously influential in the cross-fertilization of the Judaic, Christian and Islamic cultures, including the fields of music, literature, mathematics and astronomy. ideas and themes, and in the end, these are more fascinating than the messenger. Shakespeare’s take on the human condition will be one of which I will never tire and I felt it most fitting to end The Mask And Mirror with his words. “The Mystic’s Dream” was featured in the 2001 miniseries, The Mists of Avalon, as well as the 1995 film Jade. “The Bonny Swans” has been made into a video. “The Dark Night of the Soul” is based on the poem “Dark Night of the Soul” by St. John of the Cross. “Santiago” is named after the Spanish city Santiago de Compostela and by the saint that carries its name. “The Two Trees” takes its lyrics from a poem by William Butler Yeats. “Prospero’s Speech” is the final soliloquy and epilogue by Prospero in William Shakespeare’s play The Tempest. “Marrakesh Night Market” has been covered by Greek singer Kalliopi Vetta in her album Sto Phos. “Her gorgeously evocative sound (is) a distinctive richly-textured fusión of ancient Celtic music and contemporary elements.”— Lynne Van Matre, Chicago Tribune, June 18, 1992. “Wow! This is one of those rare occasions when I am virtually left speechless. I just finished listening to The Visit, and I am in awe. What an álbum. What an artist.”— Beth Lewis, The MAC Report, West Hills, Calif., April 24, 1992. 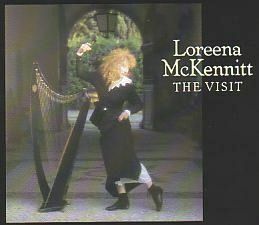 “Loreena is a truly magical harpist, vocalist, and songwriter who is tremendously popular in Canadá, where The Visit has gone platinum. The record has a Celtic feel with classical overtones, accompanied by her misty, soaring vocals…a time of discovery in which new places, people, and ideas are uncovered.”— Eric Kueckels, WNKU Radio Listeners’ Guide, Cincinnati, June, 1992. “Sublimely beautiful…a musician who knows how to be modern, but keeps her acquired traditional roots intact.”— Revue, Western Australia, Mar. 1992. “A découvrir!” — Manon Guilbert, Journal de Montreal Nov. 2, 1991. 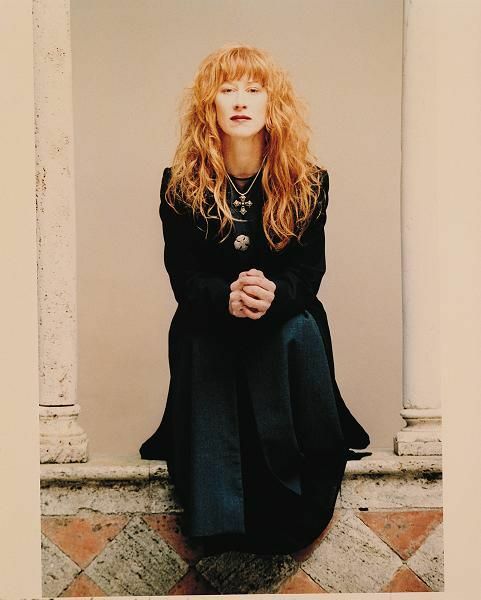 “McKennitt is passionate but never precious about her craft…her rich, textured voice wraps itself around words in a seductive fashion that, on occasion, is almost indecent. She is her own artist, brave enough to explore and transcend boundaries without losing sight of the heritage and traditions which made her embark on her journey in the first place.”— Stuart Clark, Hot Press, Ireland, June 1992. 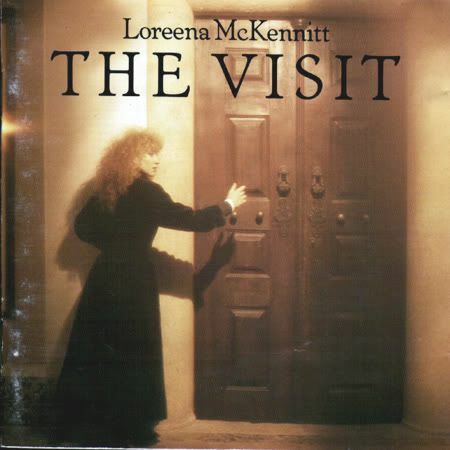 “The Visit is an álbum of exquisite beauty and depth…she exudes a sense of authenticity and clarity of visión that cuts through musical and cultural boundaries.”— Linda Kohanov, New Age Journal U.S., July/August 1992. “A stunning álbum—heart-rending beauty performed utterly without flaw, musically perfect in every way.” — Neil Randall, Kitchener-Waterloo Record, Oct. 24, 1991. 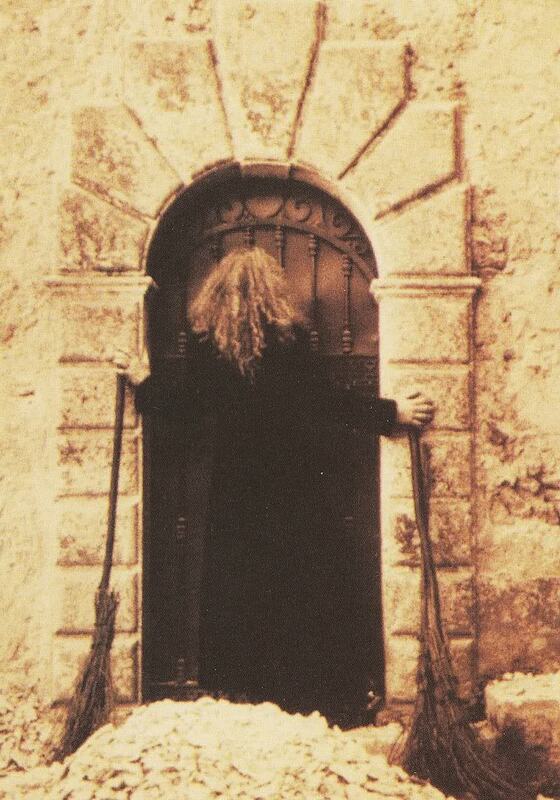 “McKennitt’s music has a wrap-around feel—haunting, evocative, and very pretty.”— Time-Off, Sydney, Australia, March 1992. “The lilting cadenee of harpist Loreena McKennitt’s voice suggests that her songs have been seized by the wind and danced over the moors. She redeems the harp’s comy image and makes her brand of Gothic folk music not just palatable but delicious. Raüng: A.” — K.Z., Calgary Herald, Oct.10,1991. “McKennitt will do for Irish-flavoured music what Hany Connick Jr. did for big band music: resurrect and own the genre. She could be the most ex-citing discovery youVe made in ages.” — Hamüton Spectator, Oct. 6, 1991. “She possesses a sharp eye for good material (her own and traditional) and a voice that makes mincemeat out of many of her contemporaries. Here, harps, synthsizers, pipes, electric guitars, fiddles and tambouras are shoehorned into the same songs and made to dance, undiluted, to a traditional tune…There’s nerve aplenty, harp playing approaching Stivell levéis of skill, modern arrangements, and (her) towering voice. It could be the folk álbum of the year.”— Rob Beattie, Q Magazine, U.K., July 1992. “Vous aimez Clannad, vous aimez Enya, nul doute que vous aimerez aussi Loreena McKennitt. Ces artistes proviennent tous du méme moule: mystique, fascinant, presque surnaturel! C’est différent, reposant et envoülent.”— Le Canadá Franeáis, St-Jean, Que. May 13, 1992. Through the course of her albums, she has teamed up with some fantastic writers, including W.B. Yeats, William Blake, William Shakespeare, and Lord Tennyson…Well, 1’m only part-joking. She has taken the poetry of these people and set it to music. On the new álbum, she does an epic versión of The Lady of Shalott, as well as an interpretation of Cymbeline. Such interpretations, where others might fail hideously, come off naturally in her hands.” — Student Newspaper, University of Brandon, Nov.14, 1991. 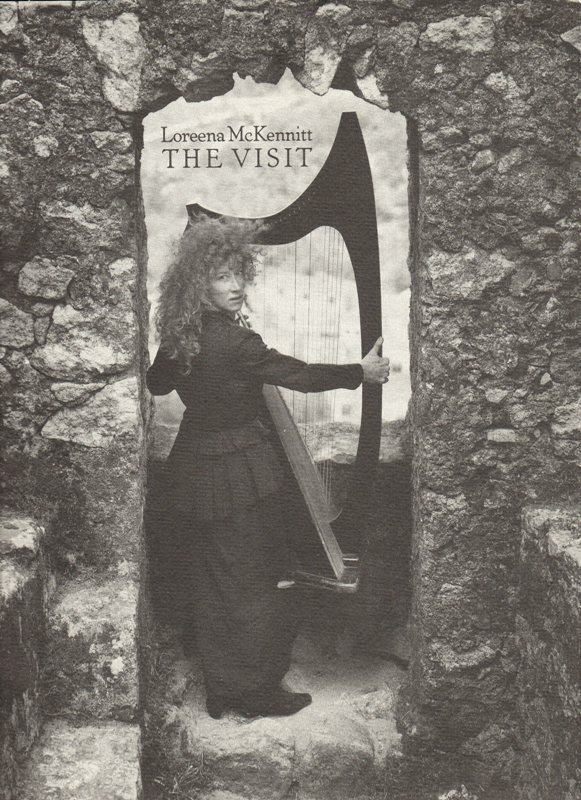 “Pristine vocal delivery and harp presented with earthy Celtic flair should make The Visii an appealing reléase…suitably romantic, steeped in mist and haunting history…a deeply evocative trip to another time.” — Michael Becker, Vancouver JVoríh Shore News, Oct. 16, 1991. 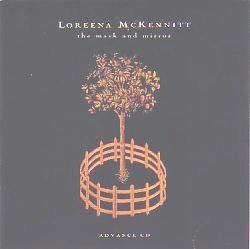 “Sur scéne, Loreena McKennitt nout fait pénétrer tranquillement dans son univers…Tantót a la harpe tantót au piano, toute de noir vétue. McKennitt méne le bal avec sérénité. Le charme de la barde á la chevelure de feu opere lentement mais sürement.”— Michel Bilodeau, Le Soleil Québec, April 12, 1992. 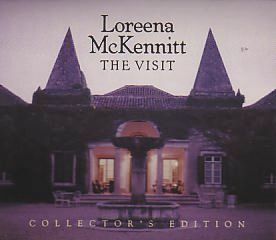 Recorded in the late summer of 1991, “The Visit” is Loreena McKennitt’s fourth album. It expands on earlier celtic musical and cultural influences in a fresh and contemparary way. The album includes an unusual version of Greensleeves, a setting of Tennyson’s The Lady of Shalott, and a number or original pieces including All Souls Night and Tango To Evora (from the NFB film The Burning Times). The long considered the creative impulse to be a “visit”—certainly it arrives (often unbidden!) in my life, usually after knocking on the door a few times. I wait for its arrival, and do my best to prepare for it. Then, of course, there are the ingrained beliefs and rituals of the Celts, built around birth and death which treated the land itself as both holy and haunted; for so many people, this life itself is a “visit”. And the visit—any visit—is a time of discovery; new places, new people, new ideas. A thing of mystery: “Who is this, and what is here?” wondered King Arthur’s knights at the sight of the Lady of Shalott. Thank heavens, most people will find their own individual “meanings” in the music on The Visit. And I don’t want to define those meanings for them; however, people may be interested in some of the inspirations which visited me as this music was made. Japanese tradition celebrates the souls of the departed by sending candle-lit lanterns out onto waterways leading to the ocean, sometimes in little boats. That tradition, along with the imagery of the Celtic celebrations of All Souls’ Night—with huge bonfires lit to mark the New Year, but also to warm the souls of the departed—was in my mind when this piece was written. The destruction of oíd growth forests is not, alas, a new phenomenon. Over the centuries many of Ireland’s grandest oíd oak forests were destroyed (as they were in many other European countries) for commercial and military use and shipbuilding; only recently have there been efforts to re-establish these great forests. The Great Oak of Portmore used to stand in the grounds of Portmore Castle, on the shore of Lough Beg. Originally, we were going to cali this Persian Instrumental, but eventually it acquired a more enigmatic title. It certainly is a little more exotic than many of my pieces, thanks in no small part to Rick Lazar’s percussion; Brian Hughes, who played balalaika as well as guitar; and Hugh Marsh’s ethereal fiddle playing. I played both the harp and keyboards. This Tennyson poem has long been a favourite of mine, and I rediscovered it just before the sessions for The Visit. For the thousands of people who learned the piece when they minutes of it!—may come as something of a surprise. I jokingly tell people that this was my attempt to get a hit, now I’m signed to a “major” record company—and an edited version of it is indeed getting radio play! I had always wondered how Tom Waits would sing Greensleeves. When I was in the studio making my previous record, Parallel Dreams. I sat down at the piano—while I waiting to do something else—and spontaneously began to play this song. Brian and George joined in, and thank goodness the tape was rolling. Some people say Henry VIII wrote this song; in any event, Tve always heard it as a much sadder piece than most people who hum it as a pleasant Christmas melody. So, here it is, Tom! This piece was originally conceived and recorded for the National Film Board’s The Burning Times, directed by Donna Reid. Although this was written long before I visited Portugal recently, when I hear it again it reminds me of my visit, and a Sunday afternoon in a park with a group of local musicians and singers, who invited me to visit with them. Half way through the recording of The Visit. I took a week off to travel to Portugal to take the photographs that accompany the album. I stayed in a 16th century hunting lodge, half an hour outside Lisbon, and enclosed within it was a courtyard, marked at each corner with orange trees. That courtyard reminded me of the Unicom Tapestries which hang in the Cloisters in New York, which are so rich with the earthy images of the mysteries of the life and death cycle of the seasons. Some years ago, I spent a haunting New Years’ Eve in Doolin, County Clare. The antiquity of the place—and of some of the ways in which the celebrations were marked—particularly moved me. And yet, I was constantly reminded that the celebrations were the remnants of an older world meeting the new one. And so, to end, some of William Shakespeare’s thoughts on this earthy “visit” we are all making. They come from Cymbeline. a play set at the time when the Romans were invading Britain, then inhabited by the remainder of the older Celtic order. 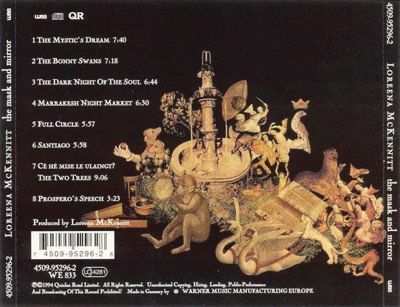 All compositions by Loreena McKennitt except as noted. 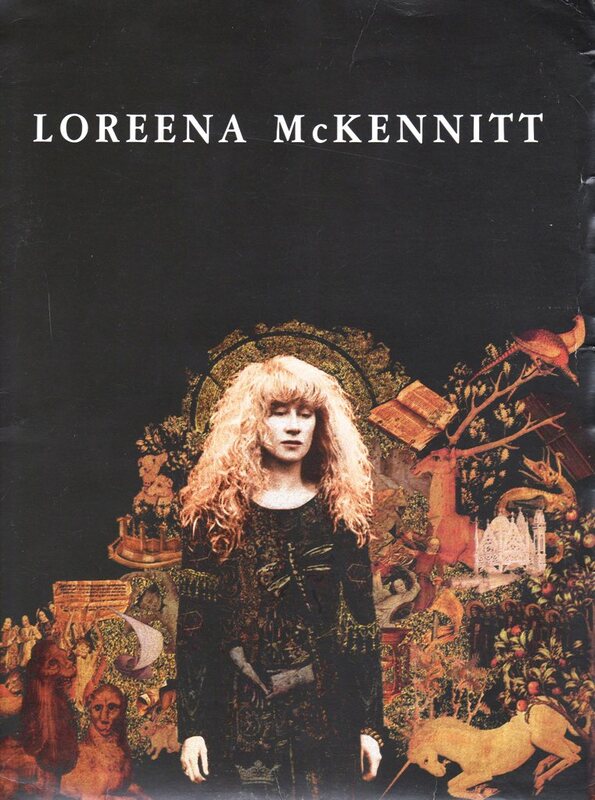 Suggested Albums: Loreena McKennitt – A Mediterranean Odyssey: Limited Edition, commemorative two-disc set to be released, from October 19th, 2009. From time to time, projects are born unintentionally or they are born at the same time they are conceived and A Mediterranean Odyssey is one of them. 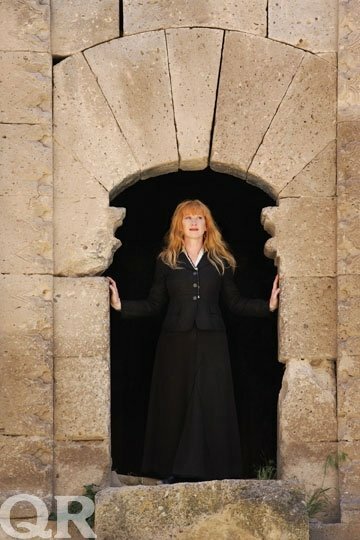 Inspired by Loreena’s fascination with the Celts in the broader Mediterranean region, this special Limited Edition package consists of two CDs in a richly designed slip case. 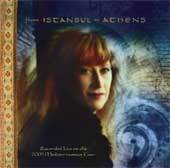 The first CD, From Istanbul to Athens, consists of ten new live recordings made during Loreena’s 2009 Mediterranean Tour, including songs that have never before been recorded in concert. It will also include a twenty-four-page, lavishly illustrated booklet featuring on-location photographs captured during the 2009 Tour. 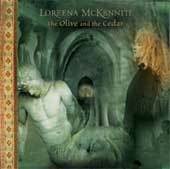 The second CD, The Olive and the Cedar, has a Mediterranean theme c urated by Loreena herself. It contains previously released studio recordings created between the years of 1994 and 2006.
members will be informed of the release schedule and pre-order opportunities. A Mediterranean Odyssey will also be available for purchase by mail order from the Quinlan Road shop in both Limited Edition and Budget versions. We have reserved quantities of the Limited Edition for the Quinlan Road Community enabling us to promise that all orders for the Limited Edition received before November 23rd are guaranteed their copy. The music will also be available in digital download formats from both the iTunes Music Store and the download department of the Quinlan Road shop. Article written by Danny Carnahan and previously featured on the Mandolin Magazine, and posted by kind permission of the author. All rights reserved. With Danny I shared lots of letters by the early 80’s, and sent him once a tape including Galician and Asturian music… I was dazzled to discover later that a lovely Galician tune “Caraveliño Colorado” was recorded by Danny along with Robin Petrie in their album “No Regrets”, (you may find a traditional version of the tune on Milladoiro’s Album “O Berro Seco” ) But let us plunge now on this excellent article on celtic musical connections. But many didn’t make it to Britain. They settled permanently on the north coast of Spain in regions now called Galicia and Asturias. Their dialects were probably closer to modern Breton and Welsh than Irish. Distant echoes of the old Celtic tongue still colour the modern Galician and Asturian dialects, which are very different from standard Spanish, sounding more like Portuguese, and requiring sometimes exotic spellings (lots of X’s). Galicia and Asturias enjoyed a huge folk music renaissance in the last 30 years, just as Ireland and Scotland did. Some extraordinarily talented young musicians rediscovered and reinvented the traditions, importing influences from neighbouring cultures as suited them and adding enough rocking drive to catch the ear of the next generation and guarantee survival into the new millenium. The music w as by a Galician band called Milladoiro. When I first played it, I was floored by both the familiarity and the exotica of it all. And it rocked! Here was a big, confident band with all the power of the Battlefield Band in its prime, putting across folk tunes with feverish intensity on instruments that sounded almost but not quite like the ones I was used to. Actually, the tune I’ve transcribed for you here, “Aires de Pontevedra”, didn’t feature any kind of fretted instrument. It’s my version of one of the faster bagpipe tunes on the tape. I tend to play it at about one-third the speed Milladoiro can crank up to. At any speed, though, there’s a hypnotic pleasure to it. And, like so many Galician tunes, the shape and flavor is much more Celtic than Spanish, somehow. When you pick it out for yourself, try to emphasize the first beats of each bar, driving it forward without much swing, though sometimes it’s fun to invert into a swing during the B part. You can hear how the Asturian “alboraes” (dawn tunes) resonate with Irish slow airs or Shetland Island laments, how the “marches y pasucáis” compare with regal Scottish marches, and how dances like “saltones” and “muñeires” and polkas could medley with Irish session tunes. You’re certain to want to add a few of these far-flung Celtic cousins to your repertoire. In Asturias, a member of the extinct folk group “Trasgu”, Herminia Alvarez, was a pioneer in recovering the Celtic harp, by the year 1979. Her harp was built by members of the group with the help of a carpenter. They used as a reference a model of a harp seen in hands of a figure of King David at Oviedo’s Cathedral. The group “Trasgu” published in 1983 an album entitled “The Propeller Island”, featuring this harp played by Herminia. 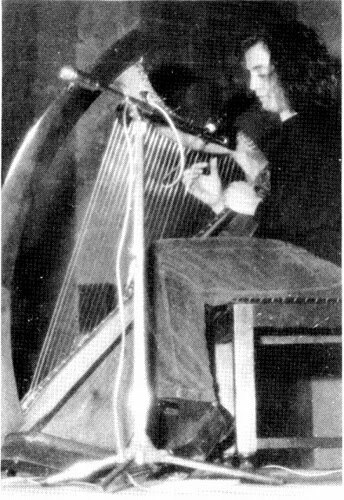 In 1980 a harp sounded in Asturias in the hands of Alan Stivell, during a concert held in the Main Hall of the trade exhibition center in Gijon. I remember well this festival because I played on it with a folk group named “Güercu”. Alan Stivell would return to Asturias later, in order to assist to concerts held at the cathedral square in Oviedo. At the time, was organized the first “Celtic Night” of Corao, in Cangas de Onís, featuring the harp playing of Fernando Largo. He played harp as member of the folk group “Beleño” , in which I participated actively. It seems that the instrument was of the house Aoyama. Fernando can be heard in the recordings of the extinct “Beleño”, and other collaborations. Although the disc that marked the start of the new folk groups in Asturias, was titled “Celtic harp”, recorded almost live in the Church of St. Isidore in Oviedo featuring Herminia Alvarez, Fernando Largo, the Breton harpist Anne Lle Signore and folk bands like “Beleño” and “Llan de Cubel”. Between 1982 and 1984, by Christmas, there were two Celtic harp concerts held in Oviedo, in fact, the album Celtic harp, is the second recording of these shows. It was held also a harp exhibition on the Conde Toreno Palace, where different harp models throughout history were shown, from Egyptian to Celtic Harps. By 1990, a diligently person in Gijón, Enrique García Tiscar with interest in the world of Celtic harp, made his own instrument, playing alone at home. In the same year of 1994, I assisted to Dinan workshops, performed by Breton musician Myrdhin and by the harpist Françoise Lle Village. Shorlty after I was able to ge a Celtic harp from Border House, 34 strings, which I adquired as a kit from the Early Music Shop, located in England. The assembly of the instrument was made by the asturian artisan Chema Vicente Pastor. The third album of the folk band LLiberdón, in which I participated actively, and entitled “Tamos fartos”, features myself playing this harp. In order to encourage the use of the instrument, I collaborated, along with the Musicians Workshop of the Culture Foundation of Gijón, in organizing a course conducted by the harp breton musician Myrdhin in April 1997. On days 2, 3 and 4 of May 2003 in Gijón we had the chance to attend a course on Celtic harp, directed by Rodrigo Romaní. We can say that 2003 is certainly the year of harp recovery in Asturias since by the end of July and in the Inter-Celtic Festival of Avilés, we had the opportunity to attend another harp course. In this case the charge of guiding the participants was on behalf of Galician harpist Xabier Gomez. This harpist, applied lessons in Asturias in 2003-07, the School of Traditional Music Quintana A, de Gijón, settling the presence of the instrument. 8 people attended the classes, including Chana Crespo. Another very important event held in Asturias during the months of October, November and December in 2003 was an ongoing construction of antique harps, directed by Pedro Llopis Arenys. On 25 June 2004, was launche in Gijon the book “Harps and their presence in Asturies”, of which I am author, and also another course directed by Xavier Gomez. 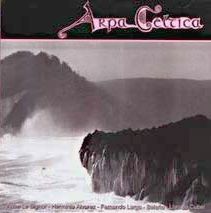 I acknowledge the interest of several people for the Celtic harp and about 25 musicians own an instrument in Asturias. There are young people like Yago Prado, from the folk group Llangres, which play a model of 34 strings of Cambrian House. Mento Hevia, from the folk group “Gueta Na Fonte” also plays the harp. In Gijón lives another harpist. He owns a Troubadour model from Salvi and a Melusine, form the French House Camac, his name is José Jaime Rubial. Another person, Javier Dominguez, who lives in the city of LLuarca, acquired in 2000 a type of Celtic harp constructed by Galicians Luis Martinez and Lorraine Reinaldo. Jose Luis Santaeufemia is another young man settled in Tapia, owns a Korrigan model harp from Camac. Samuel Set González, from Avilés, acquired in 2002 a Celtic harp from the Border house , model Wye. In Oviedo, Xuacu Amieva, the renowned asturian Piper, has began to study harp, along with his daughter Paula. Another person related to the Celtic harp in Asturias is Dorothy Gillet, she has settled in the city of Ribesella and plays in do with John Allan, her husband, who deals with different wind instruments. Dorothy’s harp, has 34 strings, built by Peter Brough, craftsman who lives in Devon, southern England. The Inter-Celtic Festival of Avilés, in 2006, also attended Xavier Gomez. On the 1st, 2nd and 3rd of June 2007, we were lucky to have the visit of Fred Bougouin-Kramer, who performed a concert and a new course. Regarding harp builders, in the village of Anlleo, county Navia, lives a man with great passion for building instruments, especially Paraguayan styled, but also built some Celtic ones. 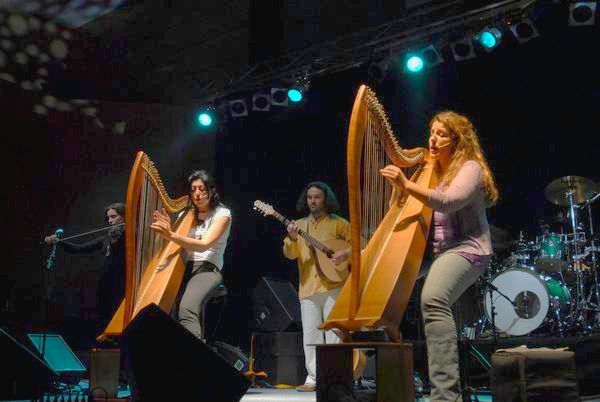 His name is Alejandro García Vázquez, his daughter, Digna Garcia, also started in Celtic harp. I very much appreciate all the help that Alejandro, Jano, I provided, since it needs from their knowledge and work. Currently I keep on performing with the Celtic harp as a soloist, accompanying recitations and with different musical line-ups, as can be seen in my site. This review was written by Daniel Garcia de la Cuesta and posted under his kind permission. In the 1970s the people who recovered and spread the use of harp in Galicia and Asturias were mainly related to the field of folk, this compiling data is about their work. I very much appreciate the assistance of Rodrigo Romaní to draw these lines, who passed me forward some data and very familiar details of their experiences through out these years in the world of harp in Galicia, Spain. Presently , the recovery is still slow, fortunately we may note an increasing number of harpists, though not to many. I think the effort to recover the use of Harps in Brittany is a good example to follow. If anyone has more information that supplements, or rinse the above, I pray you let me know to correct the data, with the desire to work on this issue in order to spread the correct and complete as possible as it benefits everyone . Currently, harpist Xabier Gomez, is working on the history of Harps in Galicia and hope that their work can be seen available as soon as possible. I am very grateful to Xavier, with whom I have a friendship, for all his researches in Asturias and some data that I provided for the preparation of this text. Thanks to the dynamism and influence that led Alan Stivell with his work on the Celtic harp, in the 1970s some companies , such as Japanese Aoyama or French Camac, began to launch their Harps, a fact that facilitated the acquisition of these instruments and makes them more accessible. I will start now on the topic about Galicia in the ’70s onwards, and within folk scene . As there are other people involved in the world of Celtic harp, you can still do a simple relationship, considering that it is not my intention to define a complete listing, but to refer the data that I gathered and those people who I know. If anyone has more info I pray you send it. In another section of this blog, come unto some data fr om historical times. A first reference in Galicia is Emilio Cao (who has an extensive discography dedicated to harp compositions). His contact with the harp begins around 1976. 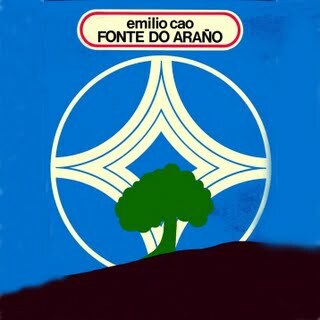 I keep as a great treasure Emilio Cao’s vinyl album entitled “Fonte do Araño”, published in 1977. 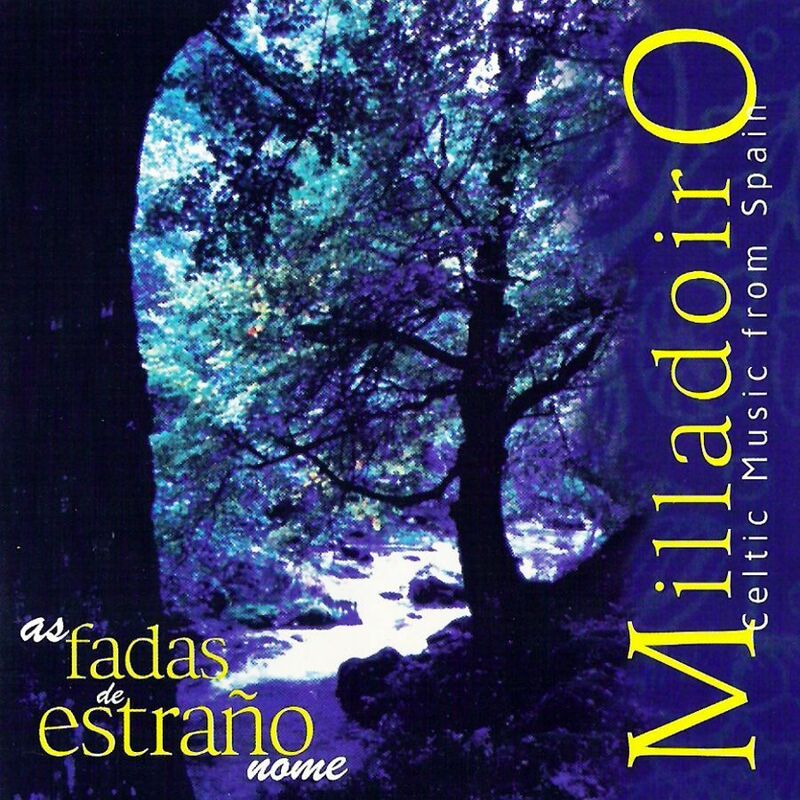 By those days Galician harpist Rodrigo Romani, edited along with Antón Seoane, the album that takes the name “Milladoiro”, famous Galician folk band where Rodrigo played Harp. According to Rodrigo, Emilio Cao got an Aoyama harp in a music store in Santiago de Compostela. On this Milladoiro album, what you hear is a zither, made in Germany same as you could find in some rural areas of Galicia. Rodrigo does not explain the appearances of these instruments. In Asturias I acknowledge the existence too, and I think that it is referred to a probable use inchurch es and monasteries. In the year 1978, Emilio, Rodrigo, and Stivell overlapped in the Galician Celtic Festival of Ortigueira. Rodrigo said that his first recording of harp made the album called “A Galicia de Maeloc” and lectured his first lessons in 1995 in the Public University of Vigo. At that time, held the 1st Harp Gaddering in Vigo, where played Janet Harbison, himself and Dario Rodrigo Duarte, from Paraguay, whom, according to friends, was the first professor of harp, with private lessons, that ever took place in Galicia. Rodrigo said that outside the theater there was a, very young musician , playing the tin whistle for the people who were leaving, his name was Carlos Nuñez. After his work in “Milladoiro” his career as Harpist continues as a soloist and professor of harp at the conservatory of traditional music in the Public University of Vigo, Pontevedra, and also directing the folk orchestra, Sondeseu, where the presence of Harps is important, featuring a set of 8 harpists. The Conservatory of Traditional Music of Vigo was founded in 1996. From the first day had the specialty of the Celtic harp. In 2008, the Conservatory changed to E-Trad, the Municipal School of Folk Music and Traditional. 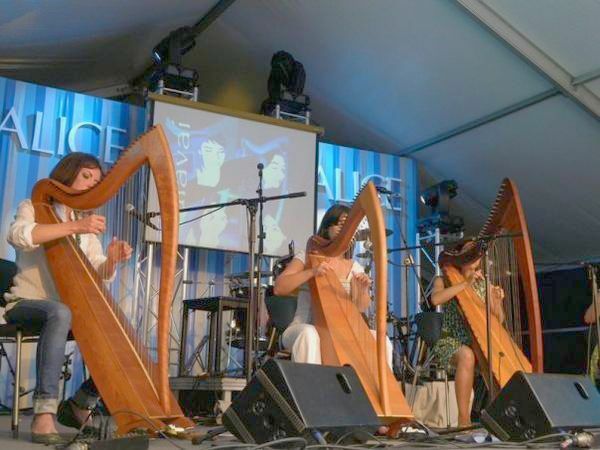 The specialty of the Celtic harp is taught in two cycles: basic in 2 years,and professional in 5 years. Every year the E-Trad welcomes 18 students for the Celtic harp. E-Trad has developed its own methodology which has its base in the traditional repertoire for bagpipe and folk songs. In the ’80s, the folk group Citania, from La Coruña, had a member who played the Celtic harp, José Alvarez, who according to the data that some friends gave to me, works as a craftsman of stringed instruments. Their first recording dates from 1986. The Galician musician, Xabier Gómez, entered on that decade the world of the harp, currently he is professor of harp at the Professional Conservatory of Music in Madrid, where he also teaches Celtic harp. Currently has 11 students enrolled. Learning the Celtic harp, which has no official character, is divided into four courses of the elementary level. The Harpist Irene Varela, participated in the first album of the folk band “Avalon”, from Vigo, entitled “Lúa Meiga”, published in 2000. I know the other Harpist, with whom I met in a seminary, settled in Santiago, named Nuria de Leon Villoria. From the classrooms of the Conservatory of Traditional Music of Vigo came out the Galician duo “Sete Saias“, with the Harpists Marta Quintana and Clara Torres Novas, with a first album published. It also came out a quartet of harpists “Lulavai“. The quartet is lined up by Josefa Fernandez, Paula Oanes, Elena Paz and Lorena Reinaldo who will soon publish their first album. At the Conservatory of Vigo also began to study people who are currently in the world of the pedal harp, as Alba Barreiro, who is expanding his studies in Musikene. I know there are more people who play the Celtic harp in Galicia. If anyone knows more information on this subject will be welcome. Harp builders in Galicia also deserve a space. In 1984, is established the instruments workshop at the Public Universtiy of Vigo, where Ramón Casal developed the area of construction of Celtic harps, among other instruments. By those days, I took part with the band “Beleño” at the Celtic Festival of Castrelos in Vigo, I remember that an Italian Celtic Harp artisan, Gabriel Sanginetto shared his experiences with the workshop. During this festival I met the musicians of “The Chieftains” and Carlos Nuñez, by those day a boy, who played the tarrañolas without stopping. Besides Ramon Casal, other Galician craftsmen worked on the study and construction of Harps, as Manuel Brañas in Ourense, and Luciano Perez, in Lugo, in order to develop a research related to reproduction of harps and other instruments that appear in the Romanesque Cathedral of Ourense and Santiago de Compostela. I also acknowledge the work of Luis Martinez and Lorena Reinaldo, builders settled in Galicia dedicated to Celtic harps, and had also passed through the Conservatory of Vigo and folk orchestra “Sondeseu”. As a first reference, and without much verification, it is possible to assure that there are in Galicia around 100 harpists. Currently are 32 pupils studying harp at E-trade, and there are musicians who engage free-lance playing Galician music at weddings, restaurants, official ceremonies, etc..